A day off on Monday saw hubby and I at a loss for lunch. A quick twitter and pop up london search lead us to Bar BBQ on Ice. Nestled behind Liverpool Street Station next to the Broadgate Ice Rink, BAR BBQ ON ICE is London’s latest pop up restaurant. The menu, inspired through travels to Memphis, promises to bring authentic flavours of smoke and fire alongside craft beers and great cocktails plus something for the kids. I was excited, as you now probably know I love BBQ & meat! I was also surprised to find that there was an ice rink behind Liverpool Street. We took quite a convoluted route around Liverpool Street station to find it due to the Cross Rail works blocking the road, but once we did we were promptly seated and looked after. 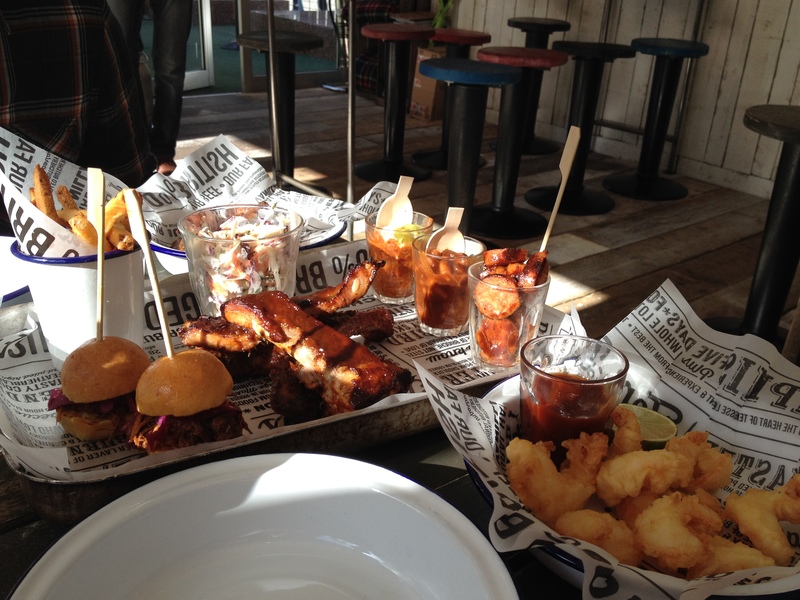 We decided to share some dishes, so we went for the BBQ Tray – which consisted of Sliders, Ribs, Slaw, BBQ Beans, Chilli, Hotdog & house cut chips; Chipotle-Maple Chicken Wings & Moonshine Shrimp. The shrimp were amazing! Cooked just perfectly and they came with a nice bloody mary dip. The chicken wings were succulent, couldn’t really taste the chipotle very much. The BBQ tray was substantial, ribs nice and soft, there was just too much for me to eat my share so I skipped on the slider, I didn’t really like the hot dog. 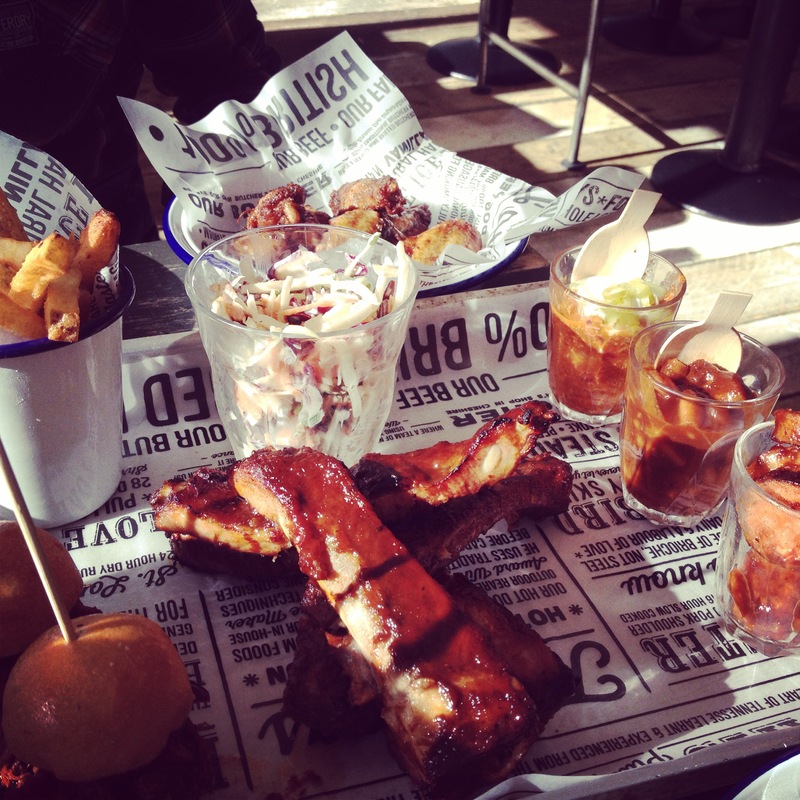 It all comes served in cool metal crockery lined with printed greaseproof paper. The atmosphere was quiet for a Monday lunch, but they had a few tables full. I guess BBQ meat is not everyones go to meal for a Monday lunch time – certainly did the trick for me. Even though it’s just a pop up the detail to the decor was well thought out. It was a bit strange eating with wooden cutlery – guess it saves on washing up! The floor of the structure is extremely ‘bouncy’ so you find yourself vibrating whenever someone passes your table. It was a great find by hubby, and reasonable given the portions. I’d go again, still need to try the Mac n Cheese. Have I ever told you about the time I ate Mac n Cheese for 3 meals in one day….??? Since publishing this post I discovered that Bar BBQ on Ice is only around until the 28th February, so best get there while you can.